Same thing as above only in screen shot version. @FameWhoreBuster @AmericanJustic3 No, it's my understanding that those are some fairly well known protesters. But the sailor's a troll. 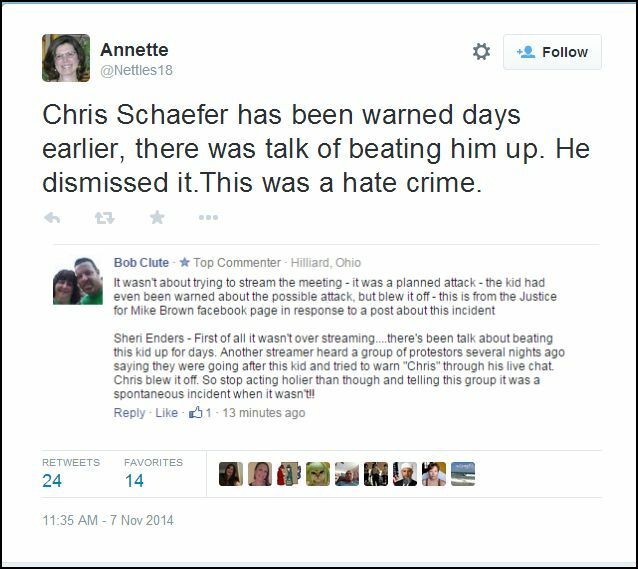 CLAIM THAT CHRIS SCHAEFER WAS SET UP! I think if you hit the profile button at top - then preferences - check allow Html - you can copy and paste embed codes from twitter, YouTube, etc. will embed the media into the page. Just another option too. If the poster of the tweet deletes it, will it delete from here as well or do you know? I am doing screen shots for those unless I am asked to stop due to bandwidth or limited amounts of graphic images uploaded. Let me know, please. @Patricialicious. We need to talk u put are name out there for something WE DID NOT DO!! @lostvoices14 Good morning. We don't need to talk. I know exactly what I saw. Your usual bully techniques won't work on me. @Fantasiaj14 A boy is beaten up in a church with 20-30 ppl in it including 2+ pastors & elected official. That is too much. So the "peaceful" @lostvoices14 completely surrounds me, gets in my face, hollers at me, cusses me, and follows me to my car. I hope everybody sees how the "peaceful" @lostvoices14 gets down. @renitalamkin @charlesjaco1 I said some of them were involved. That is the TRUTH!!!!!!!!!!!!! @renitalamkin Your cred is diminishing. @Patricialicious There was a scuffle for the phone. WE did NOT see who did what..@lostvoices14 being there does NOT make them responsible! Preachers who aren't so honest. Lord. @Patricialicious @charlesjaco1 and u didn't see more than the rest of us saw...u were up front w/us..
@Patricialicious @charlesjaco1 Call everyone's name or no name...it just wasn't fair to pinpoint them...what was the purpose in that? Belmar mentions Lost Voices as "future leaders." 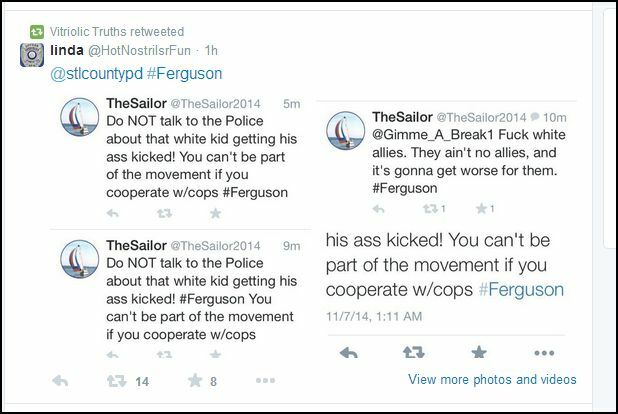 Is that why none of your cops stopped them from harassing @Patricialicious last night? @mollyrosestl They are certainly leading.